Spring 2011 - Hill-fort Ltd.
Posted March 26, 2013 by admin & filed under Tree Care. Spring 2011 was warm and early and by mid May, as travelling about the Rutland area I noticed that a significant number of Yew trees were looking distinctly sick, in particular isolated trees on the Stamford Road around the Council Offices at Catmose, at Langham Churchyard and at Burley on the hill. Upon closer inspection it was apparent that large sections rather than whole trees were being affected and at first I thought that heavy frosts might have been the cause. Yew trees can colour bronze over winter but the species is tolerant to very low temperatures and the pattern of damage was not consistent with frost damage. Under microscopic inspection I found translucent mites in numbers that were later identified as Yew gall mites (Cecidophyopsis psilapsis). A sign of the presence of this mite is a deformation in buds resulting in an unusually large bud. 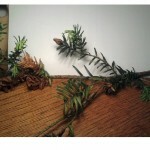 The early spring, I surmise, made conditions beneficial for the mite to proliferate and the damage caused quite severe in isolated cases, so much so that large sections of dead yew are still apparent on some of the trees and at least one of the identified trees in Catmose has been removed. 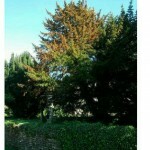 To add insult to injury another pest has been having a go at Yew trees in Rutland. A significant number of Yew trees at the Clipsham Yew tree Avenue have been badly damaged, resulting, in the worse cases, to up to 60% defoliation. I was asked by the owner, Mrs Thomas, to investigate and report upon the cause. The damage is typified by patches of dead leaves, sometimes an area of a few square centimeters and sometimes areas conglomerating to encompass metres of damage. Upon examination it is clear that each area of dead foliage can be traced back to a ring barked (entire circumference stripped of bark) branch. This damage is occurring predominantly to branches of approximately 5 -10mm diameter. Under close inspection, with a hand lens, thin strips of remaining bark and scraping marks can be found where bark stripping has occurred. Ring barking of yew branches is consistent with reports of damage (Strouts and Winter 1994) by the Bank vole (Clethrionomys glareolus), this is further backed up by the existence of nesting holes beneath trees and feeding remains on branches. It appears there may have been changes to the mowing regime at Clipsham, managed by the Forestry Commission, and this is likely be a strong causal factor for an increase in bank vole numbers and hence the amount of damage recently seen. It remains to be seen if this year’s hard winter will affect Bank vole activities and whether mowing regimes will be tightened up in an effort to control bank vole numbers.